Swiss pilot Yves Rossy (aka Jetman) is a pro, and the only one, when flying a jetpack. A gadget so new I have to add it to my computer’s dictionary. He’s the only one to have one, and he loves to show it off and honestly, we love it too. 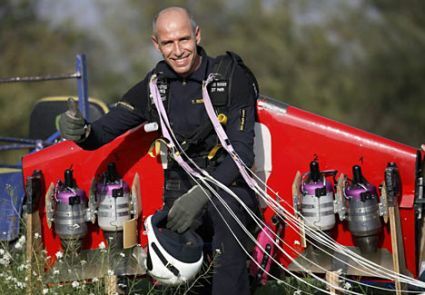 He can fly up to 120 miles per hour, and has video taped himself flying over the Grand Canyon, Mount Fuji and now Dubai. Flying over the palm islands and along with a B17 bomber, it’s astounding how brave this flyer is. Like a super hero zooming across the sky, fearless and beautiful to watch. Rossy started with a suit that took 10 years to make and only could be flown 10 minutes at a time. Today, he’s practically Iron Man. He requires a plane to jump from, but is working on making a suit that takes off from ground. -and how could we not be completely in awe? Rossy has succeeded in developing an ability that most people dream of; being able to fly.